This Series is being dedicated to the person who gave me the idea and starting material for it – but up until they see it, will have NO clue that it has been so… The Missionary and her family is in Honduras (Hope of Honduras). We were surprised by a “seemingly” out of the blue, as the saying goes (but I don’t believe in out of the blue events – they are Divine Appointments) letting me know that we had been prayed for that beginning evening. At that very point – I NEEDED those words, they were reassuring, a delivery most Encouraging. In what manner that the Holy Spirit has prompted me to complete this Series ahead of the hundreds that came before it, it is my DESIRE to listen and DO as unto the Lord – because it is by Him that we get the privilege to do so with honor. That start to a written message in her post can do more than just get some views and gain some comments, it can cause each Christian to see three INCREDIBLE words… with which we could change the world. Hope. Help. Possibilities. God’s Word is indeed filled with all three! This Series intermingles within nine additional passages, those three words intertwined within each other, like the weaving of a basket. Of all the things Ms. Amy spoke of, the most heartbreaking for me is the separation people are seemingly so eagerly making from each other, destroying family and personal ties where bonds should be the strongest. One of the reasons that is one of my saddest items is because of the destruction of the family unit – not only does it affect the here and now, it will have a VERY adverse affect on the family for many years to come – many of which NEVER recover. We have the God of All Creation who can provide stability stronger than any mountain we could ever climb. 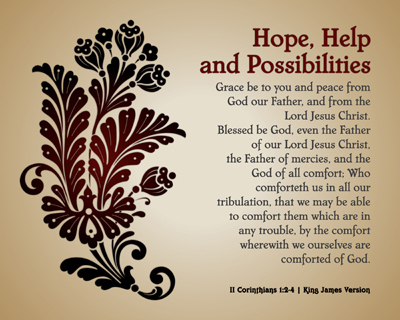 What we may be forgetting though is this, we have within us as stabilizer often not used because we lack the understanding that He is there for that purpose – we can comfort others, by the same degree we are comforted by God Himself. That does not mean we take everything on ourselves, on the contrary, we should bathe everything in prayer, seek His guidance and so He can use us to be that stabilizer in another persons storm in ways we may not understand this side of Eternity. We as Christians have the Mighty Hand of God on our lives! It is a picture of what I see in Ms. Amy with the continued holding, supporting and loving on little Oscar throughout my writing of this Series introduction. She is providing Oscar with Hope, she is Helping Oscar even when he doesn’t know how to help himself and she trusts in a future because of wonderful Possibilities that her Saviour has already provided. Incredible – most definitely. 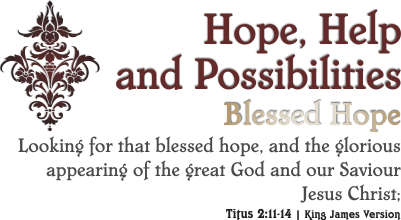 The first item, number one (1), on the list is the Series introduction, then there are three (3) sets of three (3) for each word: hope, help and possibilities. This Series means very much to me as it follows suit with how I personally want to Encourage others. The Lord has given me a desire to be in His Word and share with others in a variety of ways and manners. In doing so, there has much been learned about people, expectations, habits, and other behaviors. Wonder what God the Father sees of us when He imparts to us His Wisdom, then we choose not to use it? We are not all going to be called to a foreign mission field, but we have one – right in front of us, everywhere we go. Please do not horde or try to keep Jesus to ourselves – there is more than enough for everyone who will to get dedicated access to Him! This Series has been one that has had some “give” and a little “take” with it. Another artist on-line used a Series (with permission) to develop a set of workshops which are given “in person” and now in a DVD video set. A skeleton of a new Series was created from our discussions and thoughts shared on a possible collaborative project in the future, which happens to be this particular Series. Oftentimes the very questions that I’m asked by folks is “Why do you do all this? Doesn’t it take a lot of time? How come you don’t do something different?” People would have to “know me” to know why these sets are done – simply put, they are an outward publishing of what goes on inside my heart and mind of a daily walk with my Lord and Saviour – and a mechanism for me to put it down on “paper” as it were (John Williams that was for you!) so someone else might benefit from it. A more simple question could be asked it is supposed… Why pray? My answer, “Why not?” I’ve also heard so many others like, “What’s the use, what is going to happen is going to happen?”, “Why do you care, nobody else does?” Maybe, just maybe, the right question has not be asked yet… like, “What is the purpose for praying?” Now that, would be the right question! There is a purpose in praying, ONE real big one – talking to our Heavenly Father rings a bell! This Series has two parts to it – the first of which makes nine proclamations and the final six are things we each should be claiming. With full assurance that we are His Children, God has given us the examples to look after, given us the insight to others lives as they sought to seek His matter on things and ever more importantly how to approach Him with each one of them. We have the instructions given with how to carry it out in our lives – RIGHT NOW. There is NO pause time, no other party that has to be included – just us and the Father. Each of the first nine passages of Scripture proclaim His Goodness to us with how we can see His hand working in our lives and in the lives of others around us. The second set, which are the final six in the Series, are provided for us to understand they are truths that we can claim from God’s Word to use through His Inspired Word, the Holy Scriptures – our Holy Bible. We are given the solution about what should be considered and where we are to go to what we need from Him to do what He has equipped us to do. Once we have had the opportunity to realize and recognize that there is Purpose and meaning, for and with Prayer, our perspective will change about prayer and our involvement with the active participation in it. Many people just do not realize that the greatest gift next to Salvation that we have been given as Christians is the Power of Prayer. If we do not understand it, then we will not know when or how to use it, which not only prevents us from the benefit of doing so, but our ship of life will be rocked and pitched about with no purpose at all. This Series is broken into two differing sets by perspective only, not by design. The first list is the Professing parts of prayer and the second are the Claiming pieces of praying. There are a total of sixteen (16) prints, broken down into the two groups, with nine (9) in the first and six (6) in the remaining. 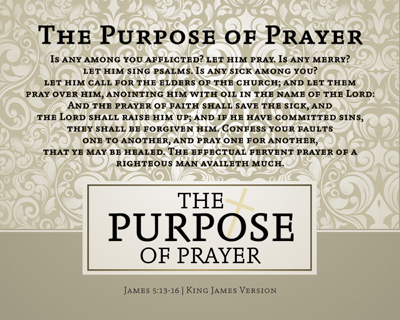 As has been said so many times, by so many folks, Prayer is important – but do we really believe that it is “Important” to our Heavenly Father, to our Saviour and the exercise of the Holy Spirit in our lives? I believe that Prayer is the most POWERFUL and least used weapon and tool we have as Christians, which is all too often the most misunderstood. The more we understand about Prayer, the more effective we can become at being more effective and precise about how we talk to God – NOTICE I didn’t say smarter, more intelligent or adjusted to His level… We can learn to be Thankful, Appreciative, Humble, Forgiving, Doers, Passionate, Compassionate, Caring, Loving, etc. The list goes on and ON, because there is NO end to God’s Love for us, therefore we will never run out of things to learn. This tiny Series gives us a wide open view into the most powerful tool we have to accomplish His Work, after His most Powerful Gift to us – Salvation through His Son’s Blood. It is my desire to be the Prayer Warrior that He’d have me be – and that is one who will have a constant stream of communication between here and the very Throne Room of Heaven. Just as with discussing this Series with Courtney, there is a VERY specific item being looked for – a Personal, Marvelous Grace, that only God the Father and our Lord and Saviour Jesus Christ can give. Notice that the word “can” is used, not the world “could” – there is a reason for that being stated like that. It is because the Grace we each will see has happened, is happening and will continue to happen to each of us, even when we least deserve it from Him. There really are too many to every catalog, to give them justice and honour anyway, but there are a number of them found in a multiple faceted approach to find those which are everyday, walking Grace that all of us can identify. The could be called the “Daily” Graces one could suppose, but I chose to call them Marvelous Graces because each of them are just that – Marvelous – surely I’d be the last to be considered marvelous by my standard or anyone else for that matter. We are measured up with or by anyone else, nor can they grant the type of Grace’s that our Lord can either. Something REALLY amazing is shown through each of the Graces given – there is no question about where it comes from – the Bible is the discovery place of them all. There are no statements made that is a repeat of some famous or nearly famous person, no movie stars turning activist on us, no man trying to predict the end of the world, etc. – just God, by way of His Son, delivered through the Holy Spirit. Even the definitions, all of them point God-ward, as they should be doing so. I’ve not made these up – they are in God’s Word, the Guide Book of the Ages. There are twelve (12) passages of Scripture that give us as Christians very clear and plain “Grace” items which we are given – there are NO exceptions, EVERY one of us have promise of them. It is my nature to put the lists in order of discovery, not in alphabetical order or the order of Bible texts – take a look at the above order… They already have one – couldn’t done that better if I tried. This Series is an odd one indeed… it looks nothing like what it did as work was begun, but yet all the elements and colors remain. Think about it this way, it is the same type of thing that God the Father enables to be done through us as we have the Holy Spirit living in us. Our bodies are the just like that – we do not have the opportunity to turn in ours and get another model. We have the same equipment that we are born with, to use as we as creation of God, matures. The forthcoming changes became apparent to me only after the Series was completed, with preparation being made for final edits. Intrigue was a large part of the design, which is a technique used for a large portion of the Series designs used throughout DeliverTheWord.com. There are two entirely different set of words, which could be seen as a second element in the passage of Scripture referenced. Both of them are of the highest importance. Are You Ready? READY! & You? 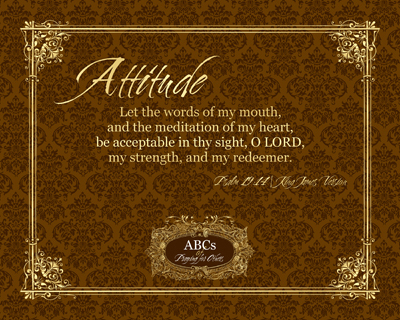 Each of these sets form phrases from which we have an opportunity to open communication to speak with those around us, how better to do that than God’s Word! In each passage of Scripture presented, a specific topic is covered and an answer provided for the Christian. Notice, there are no personal interjections presented, just the Holy Word of God to answer for itself. Taking some time to look at each of them carefully may provide a reminder of the passage presented, or may even present you and I with something we hadn’t considered before. In any manner, we will have a few more tools in our arsenal in which to speak with others about our Saviour and serving Him. There are ten (10) combination ready ties listed for this Series, which are excellent example of how God the Father uses His Word to challenge us to be ever ready for His Son’s imminent return. Each of us need to be asking ourselves that pertinent question, “Are You Ready?” and thinking of those we have influence. 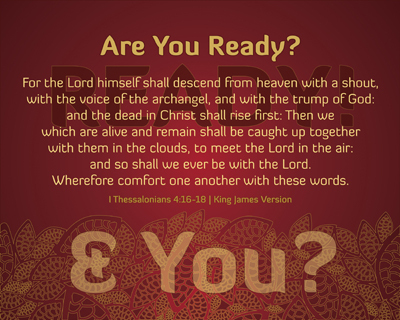 Each of these “ready” verses, ten save one, and the “prepare” verse, will give us the confidence to answer the question and present it to others, if we’ll just take the time to meet with the Lord concerning them. 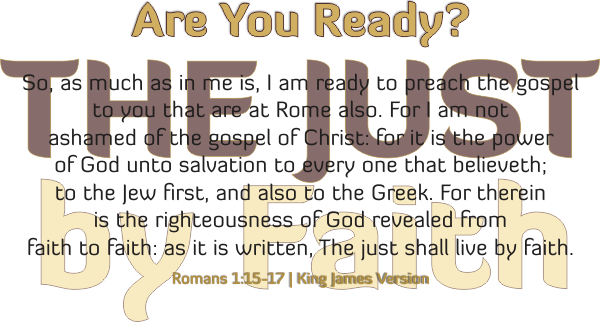 I’m READY because I Believe! The REASON is because of the Hope I’ve got in Christ. Excellent testimony & witnessing tool if you ask me!!! Many times when a person sees an individual that has what is obviously a higher order talent, skill, or what no one would disagree as “gift” given by the Creator God – it gives us an amazing uplift to just be in the presence of it being used. People don’t even have to be a Christian to appreciate and may even become entreated by themselves to stay right where they are, to witness it further. It is simply easier to pick up on/support a true talent, skill or what the Christians refers to as a “gift” given a Child of God, by His Hand, than to respond likewise when a bad one is displayed. Something that should be just as noticed, which sadly isn’t even amongst Christians, is when a talent, skill and/or gift given to an individual by our Heavenly Father is NOT utilized for His Glory. Too many times the reason which people give and, or use for not doing so, is because someone hurt them in some manner or way. That hurt can come in various forms, as in verbal criticism, overlooking, confrontation, picking or shunning, just to name a few. A tragedy on so many levels takes place when a Christian makes the decision not to use those “gifts” because it hurts too much to do so. This Series is all about that very thing and the writer of this Series knows all too well what is being shared here, because I am one of those persons, who has had all of those things done, by otherwise good intentioned people. 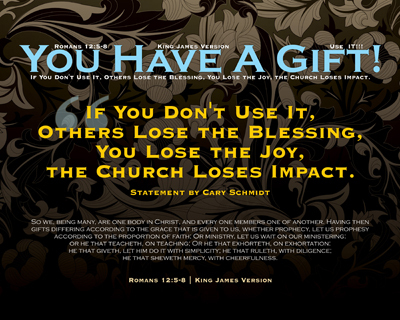 It is amazing to find so many mentions in the Bible, especially in the New Testament of which all passages of Scripture for this Series originate, about the challenges others had with the specific use of “gifts” in the church. One of the specific reasons for that heightened awareness of the challenge is because the church of the Living Christ was brand new and conversions were happening at such a quick rate. New churches were being established in every town, city, province and area of people that were from differing “walks of life” who held differing statuses in their communities and culture. Never before in the history of “religion” were such integration possible because of religious segregation if one will permit that to be used. Therein lies the challenge we have been eluding to, people with gifts that may have been misunderstood or had not experienced before, were now possible by the people who were joined together to worship and serve. Much like today, those that make up a church body are made up of people who have many talents and “gifts”, each having their own strengths and weaknesses, but collectively make the whole much stronger than the “sum” of it’s own parts. Each of us as Christians have them, they are God given and ordained to be used to further His Kingdom – not for us to hoard them, letting them sit idle. Even then though, we must remember, “we” is a collective group, made up of many members – not just one, two or a small collective who hold a form of power when banded together. You and I must remember that God the Father knows what He is doing and the Holy Spirit is a perfect director when we are placed in the center of God’s Will for our lives because the talent, skills and “gifts” will be applicable to where we are planted. God the Father doesn’t give us those abilities, then just expect us to sit idle, doing nothing. When we choose to not use them, the damage is by far more reaching than our own little sphere of decided influence. Bro. 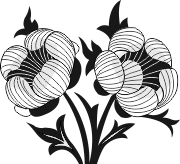 Cary’s statement is a ringing statement – when we make the decision not to use those abilities, skills, talents and “gifts”, a shedding effect occurs – the blessings of using them stops, we receive no joy from having them and the impact of the local church is impeded by our choosing not to do so. It is not just us that loses, our not using them can impact people around the globe that we may not even imagine might be benefiting from what we are doing in front of our faces. It may start small, but the ricochet can be seen down the street, throughout the community and can in ways not even imagined become such an issue that it causes a divide in a local church body. The “gift” challenges found in the nine (9) passages of Scripture used in this Series are simply amazing, with each one presenting an incredible look into how our individual walk, relationship with the King of Kings and use of those things that God the Father enables through the Holy Spirit. People are going to be people – what a powerful statement that really is if we will consider it entirely. This Series began with a simple statement, full of truth and a single passage of Scripture, becoming a Bible study that I personally needed very quickly, as it is something that every Christian needs to be aware of and work on continually. Indeed these are exciting times for those that will choose for them to be, with a wanting to do well for our Lord in the air, such that in our wanting to please the Master – we will make stronger the fellowship of believers we call our home church by using those “gifts” we have been so richly blessed. 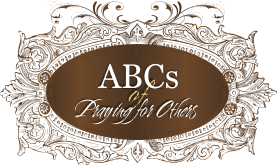 The origination of this Series is based upon a list that began as an ABCs list for teachers to pray for their students, which had been picked up from several different places. Once the verses were applied and more digging had been done, a much broader view was considered outside of the Christian Day School, which this set seems to have been developed. Twenty-six (26) items which could be directly pointed to in the Word of God that addressed specific areas in our lives to work on to improve, that would allow us to pray for others also – it was an immediate hook for me – one I knew would help every Christian willing to consider looking into them. Am stopping right before using the word “system” in the mentioning of praying, because there is a danger in anyone praying in a ritualistic manner, but this will help us with a pattern of praying for others – especially children. These are included in the areas that we pray for our daughter specifically as she is a senior in high school at the time of this writing. These have been used in specific areas in praying for my B-Sunday School kids, even when we not certain the difficulty, but knew we needed to be faithful to pray in their stead. The more this list is considered, the more it will most likely become clear that this list is one that applies to more than just kids. The prompting for this Series is rather simple and plain really, noticed that Christians sometimes have a difficulty putting into motion and words, what to pray for another individual – especially when they are not a member of their immediate family or a close family friend. Each one of us can face that dilemma at times, which we may also not have immediate Scripture to give us a foundation in which to build from in praying for that individual over time. These ABCs provide both of those things, words or concepts and passages of Scripture where we can go to get a real sense of how these applied then, as well as apply to right now with ourselves and others. Indeed there are twenty-six (26) of them to learn and allow to be included in our prayer time, both as a learning tool for ourselves and as a way to broaden our scope in praying for others. All the while, these are also exposing us to Scripture that we can us in our own lives when we are presented with these ever present situations – for they are indeed timely. Probably the most eye-opening item for me is the factor that each of these are items that I’ve learned to pray for myself – it gets VERY personal, if only we will let the Holy Spirit teach us before we go to apply it to another individual. Each of these “word” and “Scripture” combinations has a story associated with it, much like each “individual” has that we have the opportunity to “pray” for using these words. Like any captivating conversation, situation or reading material, we each have to be “brought in” in order to keep our attention. This Series from the initial view may just appear to be another one of those “lists” that someone says we should “take a look at” in consideration of others to “help” us be a better person. It is MUCH more than just a list, it is a map showing us as Christians how we can specifically become more Christlike, having the opportunity to pray the same for others – because we will then understand what we are “asking” the Lord to help them to do. This Series is just as much for each of us as it is to help us pray for another someone with a specific need. This Series is most interesting in that several out of the ordinary items occurred during the research of the verses of Scripture for it and how it applied to several things that are going on right now in the lives of people that are personally known. In as much as it helped me in my own personal time of study and learning, it allowed me to see into the lives of others and reflect back into my own through theirs. I believe that is just how our Creator wants us to view Him, we should see a reflection of Him in us as we live our lives – wherever, however, whenever, whatever, whoever we may be. As has been often said in my hearing, we were not given the opportunity to live a righteous, saved, born-again life to just do nothing – we are indeed to be doing more than just something for Him. We have been given the most important task known to mankind in the history of civilization itself – share the Good News of the Gospel with others – we are to be a Servant of the Saviour. Sometimes we as Christians may get our wires crossed with what being a Servant is really, maybe that comes with living in the times which we do, or does it? People think we have to be the best at every little detail or that we are not prepared – I’d challenge anyone to look in the Bible to find anyone totally prepared to do whatever God the Father called them to do… There isn’t one to be found – besides our Lord and Saviour Jesus Christ. Each of the pieces of this Series gives us building blocks of the time behind the requests being made and statements told that we are able to read, taken in and pattern ourselves after from the Bible. Am reminded over and over from teaching B-Sunday School, patterning is important – for if they “see” you doing something and living it out, they will likely do the same if they see it is genuine. Adding to that comes the realization our Lord and Saviour sees EVERYTHING we do, EVERYWHERE we go, WHATSOEVER we think – plainly… He see’s the real you and me, for we are constantly in His sight. I personally want to be what He wants us to be and that He expects to see. 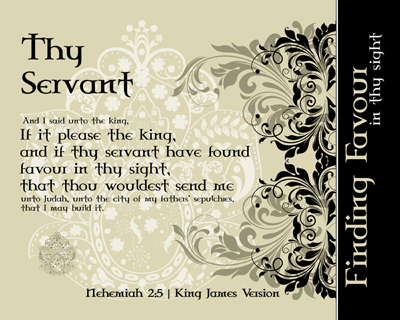 There are twelve (12) considerations that were developed for this Series, stemming from the initial focus on “thy servant” in Nehemiah 2:5 | KJV; they are listed below. In the world today, there is a prevalent display of a need to please oneself – even in the Christian realm of society – where less and less are people able to see a genuine concern for the spiritual relationship work of Christ in our lives. When we have the right relationship with Christ, we will walk with Him and others will see that walk – they more often than not will KNOW Who it is you walk with. Can you imagine being Nehemiah, having King Artaxerxes ask you what was troubling you and how might he help in the matter? There is a King of the highest order who can help with EVERY difficulty, trial, challenge and uncertainty, Who knows all the details, with an answer for each situation. One of my all time favorite Preachers has to be Bro. Dann Patrick! His exuberance is infectious – in a good way for certain – and the passion of his heart shows through in the manner where he captivates the attention of those who are under the sound of his voice as he is God’s Messenger of the time he is preaching. He peaked by sharing this poem at the very end of his sermon – almost missed it, but went back to the video to get it written down word for word, as best as could be. It really does sum up how we can know that God can do everything He says that He will perform, make happen or prevent from happening – in His timing, schedule and availability. 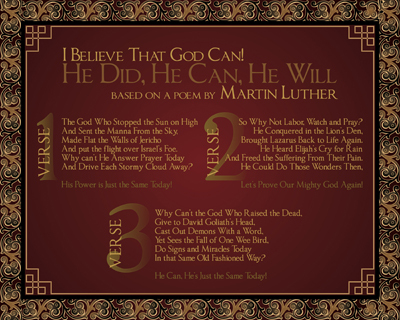 Indeed this poem was written by a man by the name of Martin Luther and has a very befitting title: He Did, He Can, He Will. What God Did in the past, God Can right now, and God Will be able to do so for all of Eternity. It does seem that we can lose sight of that as Christians in the hustle and bustle of the everyday life, but we don’t have to allow it to creep into our lives if we will purpose in our hearts not to permit it a lodging place. Tough, for SURE! Impossible, not with the Word. We may need to be reminded, or maybe even discover how Powerful He really is, such that we might Trust that Power for today’s challenges in our lives. The list for this Series contains an incredible array of items which each of us should consider, not only in those times when we tend to lean on our Heavenly Father the most, but in the good times as well such that we would be reminded of His provision for us always. His Power is Just the Same Today! Let’s Prove Our Mighty God Again! He Can, He’s Just the Same Today! Meeting someone who has been in the Ministry of Serving the Lord for sixty (60) years is indeed an honor and a privilege to begin with, but to be influenced by them is to take a few steps in their shoes every time one runs across the passion, love and dedication they have in the Ministry. In the Ministry, that influence is truly a blessing, which will FAR outlive their mortal lives upon this earth. Dr. Don Sisk is one such individual who is that kind of influence on my life, ministry and service unto the Lord. So many folks want to share with us their “facts about life”, with little regard to how that might apply in all areas in our own lives because of the Relationships we may have already established. 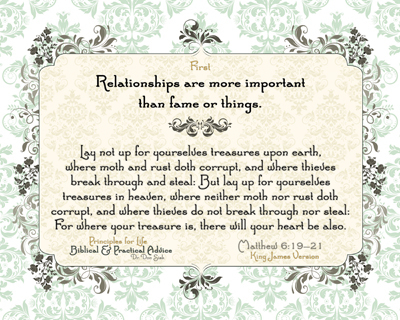 One such Relationship (notice that it is capitalized) is the between me and my Lord and Saviour Jesus Christ. Anyone who knows me knows, that the answers to challenges received about anything Spiritual is going to come from God’s Word – for they are indeed the Father’s Word to begin with, for which I have NO ability to improve upon. Dr. Sisk is one of those individuals which I’ve patterned myself after in this regard – he has a Bible answer for each question he’s been asked, for indeed he knows Who has all the answers and the keys to the questions we have yet to ask. Each and every thing we do has a rhyme and reason for having occurred, otherwise why would it have occurred? From the very first item mentioned in this “short list” version from his book, Dr. Sisk answers a VERY pointed question that most of us have asked ourselves many times, even in recent days – what things are most important for me right now? There is NO replacement for the relationships that you and I hold dear – the most precious one we have is with our Saviour. People are FAR more valuable than things, for they will last eternally. We should not value things above people, while of course there is nothing wrong with having things, those things only last for a little while. The advice presented in this Series is the shortened or condensed version of what is in the book, but gives each of us the concept of challenge/scripture matching which is applicable for each question we pose to be answered. There are ten (10) principles presented in this Series for consideration in changing our lives, lifestyle and devotion. Relationships are more important than fame or things. Nothing anyone can do to me can harm me; only my reaction will harm me. Each person is a creation of God and is unique. Happiness is a by-product of faithfulness to God and not a goal. If I am careful to do the little things well, the big things will take care of themselves. Change is always possible. Neither success nor failure is final. I must not take myself too seriously. Everyone and everything are my teachers. We are interdependent. Be all that you are wherever you are. These ten (10) Principles are tougher to make real in our lives than they may at first appear due to a bevy of circumstances, situations and challenges. It is my sincere hope that each one will be considered in the light of God’s Word and applied to each and every persons heart in the manner which the Holy Spirit intends and attends. Have you noticed something odd, yet? Who is being pointed to by this Series? You and God. Me and God. Nowhere is the comparison of it being me and you, then God. Neither is there Dr. Sisk and you, or Dr. Sisk and me – nor any combination of the three. It is simply each of us and God, through His Son Jesus, with the Holy Spirit working in each of us individually, working on these Principles taken DIRECTLY from God’s Word. There is not one thing complicated about it. There are not words, which would only be a verbal expression anyhow, that could come close to explaining the POWER of this Series. During the entire development, all that has run through my mind were the lyrics of these beautiful word-pictures of this song by the same name. The first six passages of Scripture are the one directly referenced by the song writers, but the leading of the Holy Spirit challenged me to look MUCH deeper. That look compelled me to focus on the words used in lyrics for the Series. Each of them are pieces of the incredible, powerful puzzle that make up His Might. As the verses were considered, words to describe the “Mighty” pieces became evident and purpose for those words could then be built into a framework, with the finished product becoming the fifteen (15) items of this Series. Each of these focus on either a single or double word combination, giving a visual cue of a cross link fence illusion, where the transparent words appears behind the fence and all else is in front of it. We may feel at times that we are entrapped or enslaved to the decisions that have been made, which prompted the concept of the fence. The concept prompted the imagery to be strongly presented to gain both the attention of even the most casual looker and intrigue the Believer to consider where they themselves might be in their standing with their Lord and Saviour, Jesus Christ. No matter how dark it may seem, or the things that a person seems to think they have done – our Heavenly Father waits to hear from us, the Holy Spirit longs to plead on our behalf – all of those things that come with the most precious gift we have ourselves – Salvation, being Saved – trusting in the Risen One. There are fifteen (15) words, individual and pairings, which are to serve as reminders to the Christian about how good God has been to us. Each one of them is an individual account in God’s Holy Word about His Might being shown for us to consider in our own lives, leading us towards Salvation, the most precious gift we have – Eternal Life. Each one of us have reminders placed in strategic places to help us with all kinds of things like birthdays, anniversaries, appointments… the list could go on and on, showing us and the world how busy we can be at times. But, do we have reminders about how Mighty God is? What about what the Son of God had to do, so that we might have the choice to continue to live in sin or choose Salvation and Eternity in God’s Heaven? Where are the reminders of the Old Testament foretelling of what Christ would do to show Himself Mighty? Have we decided to actively show others how we know Him as our Saviour – if so, where are the reminders of what He has done, is doing and has Promised to do for each of us? Not sure? 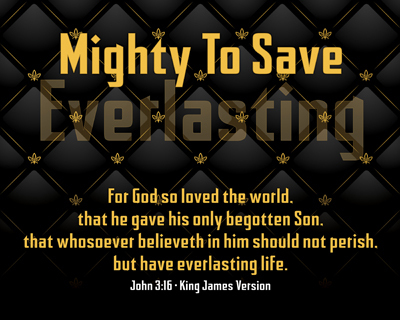 If you are reading this, you now have fifteen (15) reminders, just as I do, to tell others of the One Who is Mighty To Save! They seem so simple and straightforward to people when they are either explained or experienced for the very first time, along with the nearly perfect timing of the phrase “why didn’t I think of that” coming across the brain-gate of each of our minds. Many of those little life experiences often are based upon Bible passages that were put into daily practice so the principle behind it would not be forgotten. 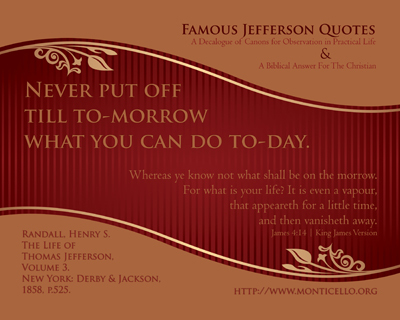 This set of “observations” actually go the opposite direction, each of these were taken from Jefferson’s sharing and compared to Bible passages, as well as concepts, to see if a verse or set of verses would match the idea being presented. A few are tight grabs, but for the most part are correlated enough to make a direct and deep tie to the lesson being applied with “Practical Life” application. Interestingly enough, much of what is presented as sound process, thought and knowledge has a direct link to the Bible and the information presented from God’s Word. The reason is quite simple – it is the Book that has stood the time and ages, proving to be a foundational book not only to our society but for the very nature of our being here. The Word of God has “rubbed off” onto the entire people groups and has been carried forth in ways and manners that could not have been considered, but have actually come to be, because that is what our Heavenly Father designed for the Word to do – spread, saturate, save. They may sound a bit odd, some of them, but many of them are normal colloquialisms we have heard in one form or another. What is it that we think of as Christians when we hear a practical life application phrase or piece of advice being shared? Some might argue that those “simple” things have nothing to do with our “religious” side, but they forget we are supposed to have a “relationship” with our Saviour, not a religious experience. When we have a relationship with someone, it is very difficult to keep a separator between who we are and our relationship with others, for we would be living two different lives. For many people, they have little clue the very things that they count as common sense items they do in life has more to do with Christianity than they first think it would and does often become revealed to be.